Every year during the summer, millions of U.S. residents will hit the road to head down the coast, over the mountains or across the country. So what happens when you cross the Pennsylvania border and are injured in another state? Personal injury attorney Brian Strong, who represents clients in both central Pennsylvania and Maryland, explains. First, regardless of state, what are some rules anyone should follow following an accident? Stay at the scene until directed otherwise by a medical professional. If you are injured but still able to move, you will want to remain at the scene until medical professionals arrive who can evaluate your injuries. If you are injured and do not feel as though you are able to move, remain where you are. If someone offers to help you, let them know you would prefer to wait for medical professionals but that they can call 911 if no one else has already done so. Always seek medical treatment, whether on the scene or at the hospital. Oftentimes in serious accidents, you may experience shock and not feel the extent of your injuries. You may also not experience the full effects of injuries until weeks after the incident. So it’s important to immediately seek treatment to have written documentation of your injuries. Even if your neck is only slightly sore, talk about it with the EMT, the nurse or the doctor, so there is documentation. If you are able to, record the names of the responding officers to the incident. They will be the ones to later file the police report which will be helpful for your insurance claim. Based on the complexities of the incident, it could take days or weeks for this report to become available. To check on the status of the report, it will be helpful to know the names of the responding officers. When you speak with officers whether at the hospital or on the scene, be respectful and helpful, but do not apologize. Most often, accidents happen so quickly, it is unclear who is at fault. As soon as you say “I’m sorry for running the red light,” you are admitting fault when in reality, if you’re able to check a red-light camera, it may determine the other motorist turned on red in a “No turn on red” zone. So be wary of admitting fault based on your own observations. Pennsylvania is a no-fault state, meaning each party involved in the accident will collect medical bills and lost wages from their own insurances, regardless of fault. Keep track of any medical treatment. Ask for reports and bills, so you can document all medical expenses. Don’t forget medications and any caregivers, including physical therapists and chiropractors. Remember injuries may be psychological. Start a journal immediately following the accident of how the injuries are impacting your daily life. List routine activities that have changed for you and any ways the injuries may have impacted your family life. Also be sure to track missed work days due to your injuries. If you’re out of state and injured in a car accident, what are your first steps? You’ll first need to find out where you should claim the accident — in the state where you reside or in the state where the accident occurred. That differs on a state-by-state basis. Your insurance carrier should be able to tell you this as soon as you place your claim. Based on that answer, you will be assigned a claims adjuster either in your home state or the state where the accident occurred. The claims adjuster should be able to help you with towing support and rental car services. 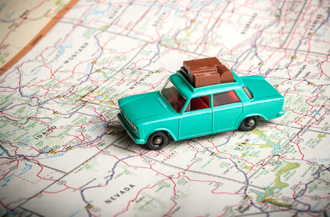 What are some of the most challenging aspects of out-of-state accidents? While towing and rental car services are expected coverages following serious accidents, they may not necessarily be covered from your current location to your home state. Oftentimes, insurance companies will specify “reasonable” towing and rental car services, which are within a certain radius or dollar amount. So if you’re talking hundreds of miles, your car insurance may only cover a portion of those services. What also becomes challenging in out-of-state accidents is understanding the rules and insurance limits that apply to each state. For example, the liability limits and rules regarding which insurance company pays the medical bills are different in Pennsylvania then they are in Maryland. Typically, if you’re a Pennsylvania driver involved in an accident in Maryland, your auto insurance will automatically extend to meet Maryland’s requirements. That’s definitely something you will want to ensure with your insurance agent, though. The bottom line is: Anytime you’re involved in a serious accident involving injuries whether in state or out of state, you should reach out to a personal injury attorney from the beginning. It’s possible that you might not even need our legal services because the other driver and insurance company cooperates. But just in case you do, we help you from the very beginning to navigate what you should be looking for and the records you should be keeping. If you or someone you care about has been injured in a car accident, contact one of our attorneys 24/7. We will fight to get you the Results You Deserve®.